Here are my plans for 2007 combined with a report on 2006. I gave 34 presentations this past year, sharing with about 1355 persons about CPT peacemaking. I see this as planting seeds which help people to consider nonviolent ways of resolving conflicts from the personal to the international level. To start off, here are some photos that catch some of the highlights of my peacemaking. Here I am planting peace seeds by sharing photos and stories about CPT with this army sergeant in the Opon. He asked several times, "Do you think a person could be forgiven if they killed someone?" He added, "It sure doesn't make any sense the way we Colombians are killing each other." Even soldiers are seeking the way to peace. in a massacre broke their years of the silence. This is an important element in forging a lasting peace for Colombia that is based on reconciliation and justice. "Your presence as CPTers helped people feel safe to share more openly and provided protection for us and them. I would like to ask you to read this letter prayerfully and consider whether you might join me in this peacemaking by giving me some financial support. My mission statement is still challenging and relevant to me: To do peacemaking lovingly, humbly, calmly, joyfully and prayerfully, so that it supports and fosters reconciliation, friendship, understanding and compassion between people locally and internationally. I gave 34 slide presentations in 2006 and had many significant conversations. I often challenged my audience by saying, "We all have a role to play in peacemaking, and the sooner we get to doing our part the sooner peace will come to this world." As one CPTer said to me, "Ninety percent of the importance of our time here in Colombia is how much we share with others about it up north." I managed CPT booths at the Cornerstone Music Festival and our county fair. At C-stone CPTer Cliff Kindy gave six seminars about Christian Peacemaker Teams work in Iraq. Eight other people helped with the booth, enabling us to have more personal conversation time with the many interested people. 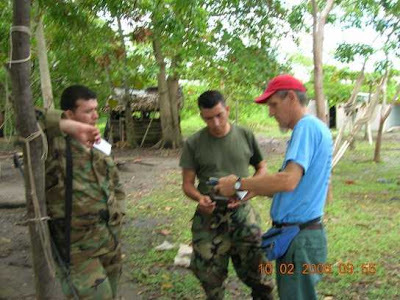 I went to Colombia in September for 2 and 1/2 months to be part of the CPT team protecting some eighty Colombian families from the threats of the paramilitaries and the guerrillas. 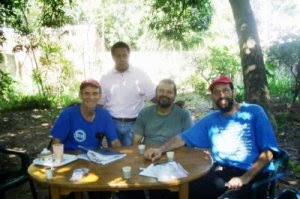 One of the more significant parts of that time was sharing with the Mennonite Brethren in Colombia as they struggle to integrate peacemaking into their lives as Christians. The Colombian church has an important part to play in bringing a justice and peace that has integrity there. I participated in our local Peace Vigil, sharing each week with passengers in the cars that drive by our messages like "Remember suffering US troops and families," "Who would Jesus bomb?" and "But I say . . . love your enemies.--Jesus". It has also been a place for us to interact personally with people who agree and disagree with us. Almost every day I spend over an hour praying for others, myself, world justice and peace. Not that I am so great at praying, but we do have the Greatest Listener when we pray. Praying helps me keep on track, for I inevitably get off track. Many of you are on my prayer list. I will do peacemaking in 2007 in similar ways as in 2006. Let's keep it going! I will continue to review my peacemaking activities, go over plans, and budget spending with my pastor and friend, Rich Foss, and with others as needed. I will plan to report regularly to supporters during the year. I always welcome your suggestions, questions, or encouragement. I am passionate about peace. Will you join me in making peacemaking a priority in today's world? Thank you for caring and for your support. I wouldn't be nearly as effective without you. I want to say a special thank you to each of you who prayed, shared your money, encouraging thoughts, edited, helped with bookkeeping, or assisted me with computer help at home. Also, I give a big thank you to those who set up places for me to share with schools, churches, and groups. If you know some group that might be interested in a slide talk, let me know and I will try to work you into my trips. Here is my budget, in which I've tried to keep in mind my commitment to live simply despite rising prices. I am grateful to have giving keep up with increased expenses. PS. Please consider acting on your concern for peace by investing generously in this peacemaking today. To maintain one soldier for war, our taxes pay $150,000 a year. I will be a soldier for peace for $22,900 a year.